I scrambled for my phone, realizing I had left it in my car. 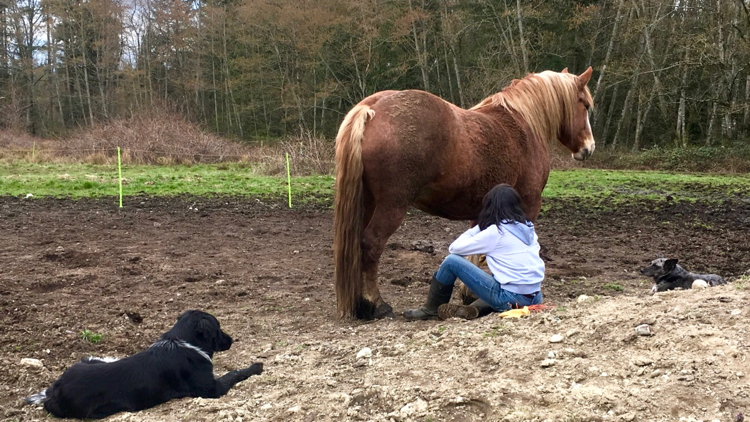 I didn’t want to miss this precious moment I was quietly witnessing between Jini Patel Thompson and her giant horse Aude. She was sitting on the earth, finally able to since the weather was warm and dry for a few days, giving the cold wet soil a chance to dry off – at least the top few centimetres were dry enough to not seep through her jeans. So Jini quietly gave me her phone, which I took ever so gently, by making myself as invisible as possible, so as not to change the palpable energetic vortex that was created by the conversation between the two of them. There was a tenderness, intimacy, and balance of the energetic boundary of where the personal safety bubble of Jini was, and the physically massive body of Audelina. For those that don’t know her, she’s a very big Belgian mare, who is not yet “trained” or “broke” so she is quick, and still in her fullness of loving being in her body. This works for and a bit against the one sitting on the ground in vulnerable and open presence. Aude is basically untouched, so she is very aware of her body. Her energies have been allowed to be hers in their full power and manifestation. But, because she is not yet aware of her giant size, and the the actual frailty (relative) of the tiny body on the ground, she doesn’t understand that she can’t bump into the human with her giant hoof, or very large shoulder, without some form of consequence to the human. I was observing the very subtle communication between Jini’s body and Aude’s legs. I could sense the split second before Jini’s energy changed, when her body became uncomfortable with how Aude was going to move. 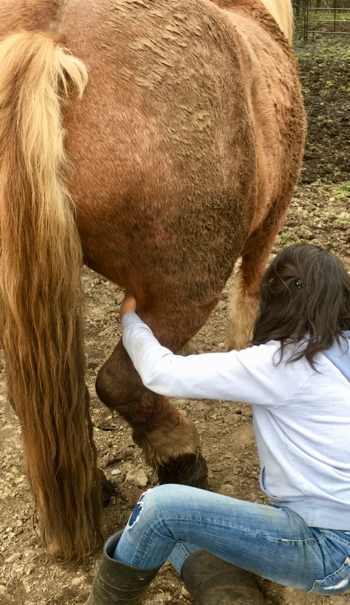 Jini experienced a physical impact by one of her horses about 6 months ago. Her body is now in a place of “on guard receptivity”. She is ready at any given instant to leap out of the way. There is a very fine line of really allowing the full expression of the horse to reveal itself, and blocking it because of fear. Trust is not something you have a bit of. You can’t sort of trust something or someone. It’s like the notion of trying to do something. You either do it or you don’t. You either trust or you don’t. And both of these are OK! Jini is VERY good at NOT confusing the horses. She is clear both in her spoken word, and mental images of the TRUTH of what she is experiencing in her own body. She is aware of what she is experiencing, and she does NOT try to pretend. In the horse world, we call this congruency. When the energetic body matches the physical body, the mental images match the emotional energy. As you can see in the video below, Aude knows exactly where her feet are. Jini is clear and honest about where she is within her emotional, mental, and physical body. Aude is then in trust of Jini, and vise-versa. When there is clarity, there are boundaries. Where there are boundaries, there is safety, and where there is safety, there is trust. So, as I observe what trust looks and feels like, my thoughts are inspired to look into life and how we have been conditioned to live. Where have we become so unclear about our boundaries, that it becomes an actual dis-ease in our lives? And how can we shift from the place of not knowing (it’s not your fault, it’s a conditioning of a culture that is fed by being told what to do, what to eat, where to go to school, what car to drive, what job is the best for making money and what is the best way to spend your money…) to a place where we are led by our hearts, because we TRUST our hearts, because we have developed a relationship with our hearts based on clarity, safety, and trust? What does safe intimacy look and feel like? 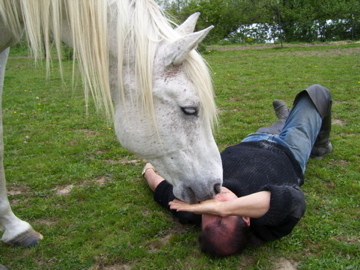 We can delve right into the analogy of the horse and human relationship and apply it to a relationship with ANYONE. First, let’s feel what safety feels like to you. For me, safety means feeling comfortable in my vulnerability. In the case with Jini, she is feeling comfortable in her vulnerability under her horse. If at any point she gets uneasy… the energy shifts, and the horse (in particular these wild ones) FEELS it and senses it, then the horse goes into uneasiness, which then shuts off her careful awareness of where her feet and body is, and the horse is now standing on guard for what it is that made her human uneasy. So, it shuts her down to Jini’s energy, where Aude is no longer paying attention to where she is putting her feet. It is in your hands where the level of comfort lays, and it is vital that you stay in this place, and as Jini states in the video, slowly work your way up to a closer encounter, and to be honest within it. Do not tell lies to yourself, because the horses can feel it. So as I’m filming this, I realize that we are touching on something much bigger than what meets the eye. It brought me back to a recent relationship with a human where he felt that I was shut down; with a certain unwillingness to share intimacy. Remember, intimacy is more than just a physical reality. What was happening in that relationship was a shut down from my own emotional, as well as mental body, because I did not feel safe in expressing those aspects. However, I felt totally comfortable with physical affection because… I felt safe physically. I have ALWAYS felt physically safe around humans AND horses because I have never been physically abused or hurt on purpose. But, emotional and mental intimacy are a different story. So… here is where the work can begin. And how just simply sitting with a horse can bring about deep perspective changes within ourselves. Where do your mental images in your relationships (human or animal) not match your words? This can make for an untrustworthy experience for the other person, or animal, in relation to us. This creates a confusion in the other being and therefore a sort of attack on us emotionally and mentally – and thus can create a shut down in ourselves; a blocking out and a very unhealthy understanding of boundaries. This is where this work can be so powerful. In just paying close attention to ourselves. Sitting with your horse, and going inwards. At which point does your own energy shift, and what is the horse’s response to it? Go try it and lets hear about what comes up!!! JJ, It was such a whap to the head…. Intimacy is a WHOLE other ballgame in and of itself. It’s such a big word with such depth and vastness. 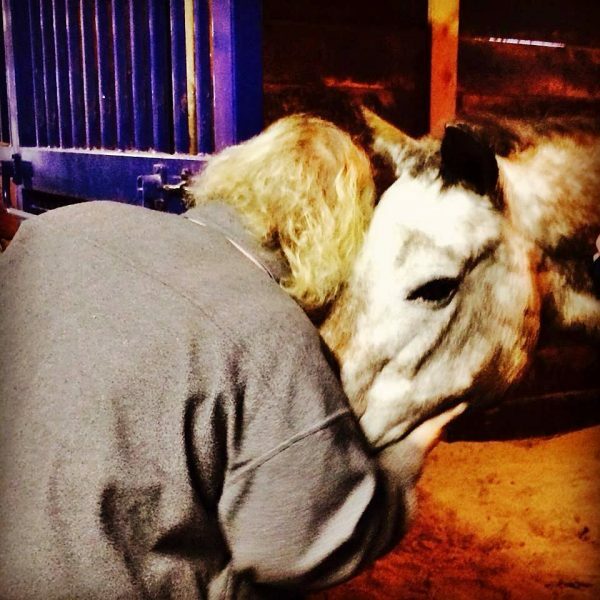 Also why I think horses are becoming so popular in the healing world. Teaming up with humans helping us see ourselves with different eyes. Ver very powerful stuff. Great insights Michelle. When you think about it, a horse’s mouth is like an elephant’s trunk. It is their primary method of sensory exploration (along with smell). So what’s the effect on a relationship when we shut that down? I love what you’ve written here and your experiences with Bullet – just wonderful. I think I had to wait so long to reply because I actually got “bit” by a horse for the VERY first time. EVER! … intentionally. Blog post on this fascinating event to be posted. They DO know what they are doing. Getting to the point of trust is kind of like watching Jini test the electric fence the other day..the anticipation is almost too much. Letting those lips and mouth explore in Full knowing how strong those jaws are. And yet, also knowing that they do receive so much information with their mouths. Today, I watched as Montaro took my shirt…most of it in his mouth. I had to stop and watch as he chewed blissfully, like when we chew gum, and sometimes the gum just feels so good massaging our gums. He was enjoying it so much I actually let him just chew and chew until my shirt had holes in it. Which then prompted the thought about teeth and gum management. I used to make felted wool laundry balls and realized my dog LOVED to chew it. I actually saw the plaque from my dogs teeth disappear. I think the next experiment is going to be to find some pure coarse wool, felted strong enough that it won’t break apart. ( certain types of wool are more coarse and stronger than others) And see if it will help clean their teeth. Thank you for your insights, and sharing with us a bit of your world with Bullet. This photo is so precious! Thank you Kris for sharing. It would be great to hear some of your stories and the wisdom you have gathered from listening. A gift many of us have forgotten. I love you still have it. With respect, trust and affection, all things are possible. Adam, this photo is so lovely. The trust here is palpable. To be able to calm ourselves enough to lay like this so vulnerably on the ground is like a Jedi meditation. If you can be here, and calm, and trusting. You can be anywhere. Just go to that place of centered being, and watch the magic unfold around you.You must have a pretty amazing life. SO nice to see. Thank you for sharing this. I love this! I love to see Jini “seen” from someone else’s perspective, and I love what you wrote Guliz. It’s such a great topic, expressed in a way so unlike any other if we compare it to the typical or even progressive views about how to be around horses. Even though I have been the guardian of horses and have been around them (not just mine, but others) daily for over a year, I consider myself someone who has a very strong sense of self-preservation 🙂 . I would say I have been super cautious and guarded around them (which describes how I live my life too to a certain extent), partly because I know and can feel that w/ 10-15 horses in a pasture, people are coming and going, tractors moving about, cars driving by, there is hardly ever a time when we can be quiet like the way expressed in the video. I know those times will come when we are not boarding anymore. But partly I also noticed that the guarding attitude comes from not having felt safe, period. And what great revelations horses bring to us! I have been noticing myself being more trusting of other horses (not mine, w/whom I have developed a good relationship despite all the distractions) who come up to investigate me. I have noticed I am letting them smell me and check me out in a way that I just could not do some months back. Back then I had to either touch them, or move away if they came up to me. I realize that I had to be in charge of the interaction, as I could not just be standing there letting THEM be in charge. And that has all changed recently, when I found myself just standing there and letting their big faces on me….It’s not food they want, as I don’t bring any. So that was such a great awareness for me! Yay! And of course I felt safe doing it, there was no thought/planning in it, it just happened. And it felt great. I was thinking about this whole topic recently, because we’ve all seen the videos where the horse “pets” the cat’s head in such a gentle way with her mouth, really caressing the cat with the exact tenderness/roughness a cat wants. But then you read about accidents happening to people who were just standing there when the horse stomped a foot because of a fly… So I guess it’s all relative, and some horses are more aware/sensitive, and some aren’t, just like people? It is one of the greatest teachings I feel. Especially in this field of “animal communication” that I work. Our agendas, which are mostly associated with fear blocks the information absolutely. I do think sometimes a horse is just being a horse and pushes us and each other around because… that’s their nature. They play rough in our eyes, and kick hard when they want. And then, there are those times where the horse does something VERY intentionally like the other day when Audelina bit my hand. Fully in her mouth. hard. OUCH. This was something to pay attention to. These horses are teaching us to listen, and how wonderful it is to have each other to share our experiences with.